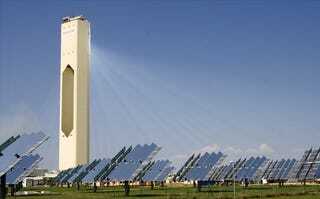 A Spanish company has built a "Solar Power Tower" near Seville that could easily become the world's first orbital solar death ray. It generates electricity via sunlight without photovoltaic cells, using 624 mirrors called heliostats to focus sunlight on a receiver at the top of the tower. The system generates temperatures hotter than the surface of Mercury. Abengoa Solar's PS10 power plant generates 11 megawatts of clean power, supplying more than 5,000 households. The heliostats automatically swivel to follow the sun and focus maximum sunlight on the receiver at the top of the tower. The company claims the potential to generate temperatures in the neighborhood of 1,800 degrees F with an efficiency 25 percent greater than current photovoltaic technology. Prototype towers were tested in the U.S., but PS10 is the first commercial plant. More Spanish towers are planned with greater power generating capacity. How hard would it be to put a mirror array like this into orbit? With GPS, it would have pinpoint accuracy, cause incredible damage and leave no unpleasant radioactivity behind. Company reps swear they have absolutely no plans to demand a $500 million ransom from the world's governments to keep them from incinerating cities. Top photo by: afloresm. Schematic by: Abengoa.